People like to show off their wheels, especially if they are classic autos. Car shows are an important part of many community celebrations during the summer. Various awards and plaques are presented at these car shows. Here are the car shows and cruise-ins that usually occur. Mushroom Festival Cruise and Car Show, Mesick. Cars in the Park, Northport. Northern Michigan Hearse Cruise, Gaylord. Bike & Trike Rally, Pentwater. Manistee Ford Annual Benefit Car Show, Manistee. Classic Car Show at Irons Flea Roast, Irons. Late June - Old Town Classic Car Show, Traverse City. Manistee V.F.W. Cruise Night, Manistee. Forest Festival Car Show, Manistee. Scottville Summerfest Cruise and Classic Car Show, Scottville. South Arm Classic, East Jordan. Bear Lake Days Car Show, Bear Lake. Street Legends Cruise/Car Show, Charlevoix. Kaleva Days Car Show, Kaleva. Arcadia Daze Auto Muster, Arcadia. Onekama Days M-22 Road Rally, Onekama. Onekama Days Car Show, Onekama. Antique Auto Show, Boyne City. Alden Classic Sports Car Show, Alden. Harbor Springs Car Show, Harbor Springs. River Ride Classic Car Show, Manistee. 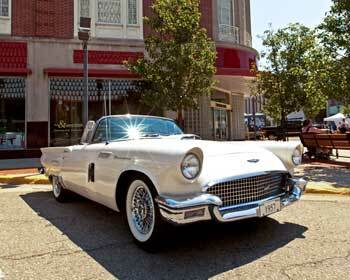 Collector Car Show & Antique and Classic Boat Show, Frankfort. Mt. Hope Classic Car-Truck-Bike Show, Gaylord. Labor Day Car Show, Boyne City. Rock 'N' Rides Festival, Buckley. Geno's Downtown Thompsonville Car Show, Thompsonville. Oktoberfest Classic Car and Hot Rod Show and Cruise, Pentwater. Also, check out West Michigan Guides and our locally produced West Michigan Business Directory for our largest lists of Things to Do in West Michigan.